With the SJA website receiving more than 1 million hits a year, plus attracting a significant Twitter following, the SJA has the right platforms for you to advertise your organisation, job vacancy, event, services or product. The SJA has a track record of successfully working together in partnership with a range of leading sporting and commercial organisations, including the National Lottery, UK Sport, the 2012 London Olympic organisers, the British Olympic Association and the SportAccord covention organisers, charities such as the Royal Marsden, Cancer Research and the Laureus Foundation, plus blue chip companies including BP, Ladbrokes and BT. 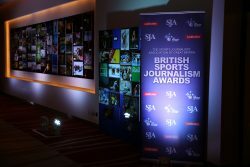 The SJA’s two annual awards events – the British Sports Awards staged each December and the British Sports Journalism Awards each February or March – are established among the highlights of the sports and media awards season, and offer outstanding corporate hospitality and sponsorship opportunities. The SJA’s sporting lunches and events are staged for the benefit of our members, providing access to some of the biggest names in sport, and have a strong track record of generating strong back-page headlines. We have held a Westminster sporting Question Time and staged a diversity forum thanks to our partners. Lunch guests have included world champion boxer George Groves, Michael Vaughan, Sean Fitzpatrick, Phil “The Power” Taylor, and Olympic gold medallists Rebecca Adlington, Edwin Moses, Ben Ainslie and Christine Ohuruogu. England’s Rugby World Cup-winning captain Martin Johnson, Baroness Grey-Thompson, Britain’s most successful Paralympian, former England football captain Terry Butcher, plus top adminstrators such as Lord Moynihan, Sir Clive Woodward, and former sports minister Hugh Robertson have all supported our functions. Whether it’s being a headline sponsor, supporting a category in either of our awards events, advertising on our site or providing backing in other ways, the SJA would be delighted to put together a bespoke package.